For Kids’ Sake Montessori is a privately owned and operated Montessori School for infants, toddlers, preschoolers and kindergarteners in Southfield, MI. The owners began their business in the summer of 2000 and our new facility opened in August of 2008. After researching and studying the Montessori Method and learning that Montessori education leads to children with better social and academic skills, For Kids’ Sake became a Montessori Children’s House in 2011. 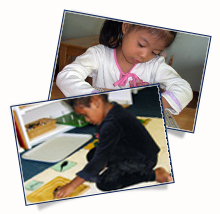 For Kids’ Sake Montessori challenges and sets high expectations for all of their students. We have a rigorous academic program utilizing the Montessori approach to education which is designed to recognize and address different learning styles. This helps students learn to work more effectively and creates an internal desire to learn. Our Academic Program is designed for students to have individualized curriculums and learning goals.